We run out 2 targets simultaneously. 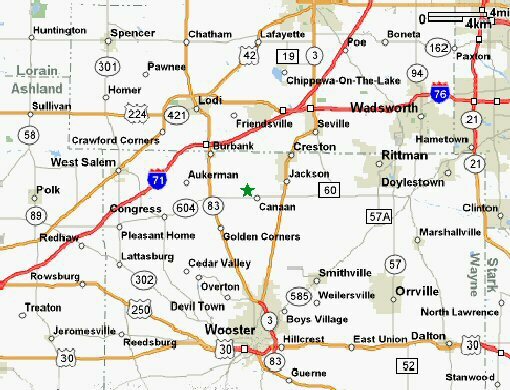 The distance is 98 feet. We use 7-1/2 shot in 12 gauge shells supplied by the club. We can also supply 16 gauge, 20 gauge and .410 gauge. Shoots are Sunday morning starting at 9:00 a.m. and ending when all rounds are shot. 12th Round - Bulls-Eye Round – Cost: $2.00 – Prize - Money (You must shoot all $2.00 rounds (1 thru 8) to participate in this round. You may have 4 shots maximum. The prize in this round will accumulate until someone cuts the “X” totally out. 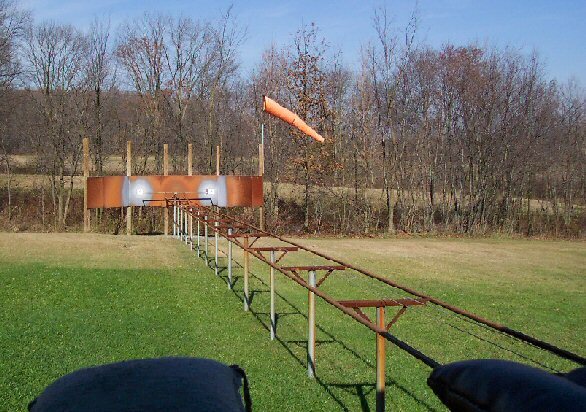 The club will take out $.25 for each shooter to cover cost of targets and shells. 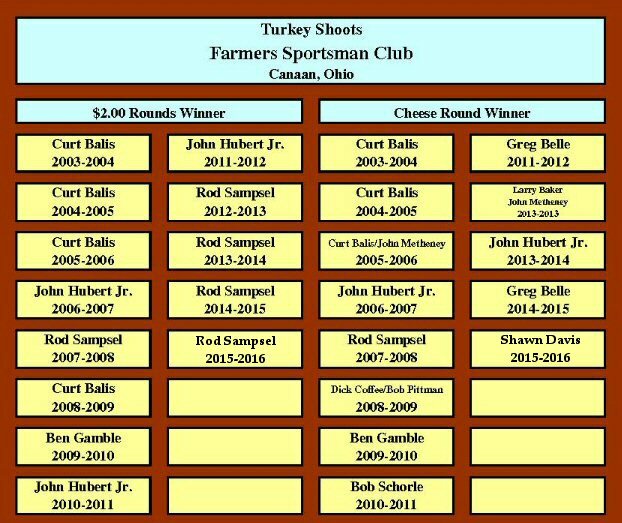 At the end of the year the person with the most $2.00 round wins (1, 2, 3, 4, 5, 6, 7, 8, & 9) will get their name engraved on the Winners Plaque found on the wall. The winner of the most cheese rounds (round 9) will also get their name engraved on the plaque. 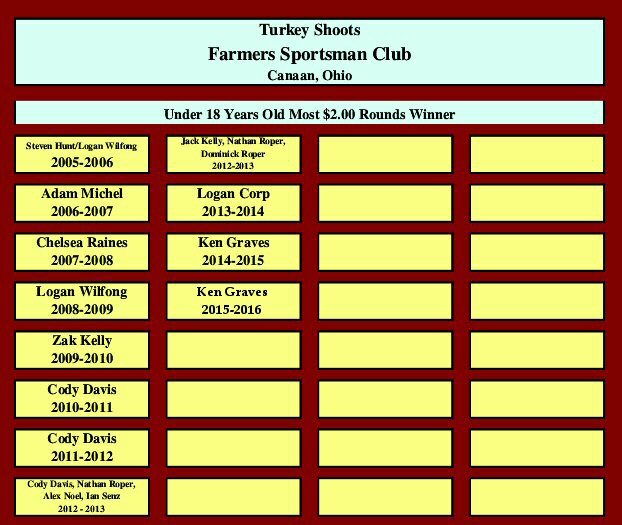 The shooter under 18 years old with the most $2.00 round wins will get their name engraved on the under 18 plaque found in the same area. We can shoot 20 targets at one time. The distance is 82 1/2 feet. 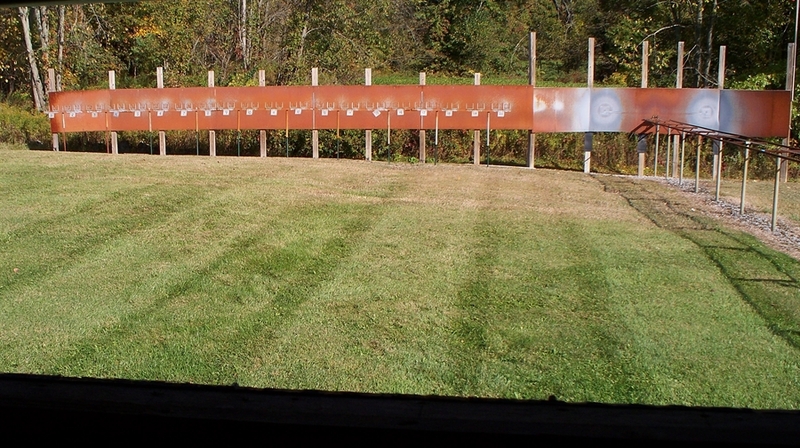 We use 7-1/2 shot in 12 gauge shells supplied by the club. Shoots are Saturday morning starting at 10:00 a.m. and ending when all rounds are shot. Stock guns only. .671 minimum choke diameter. Open sights. 32 inch maximum barrel length with choke.